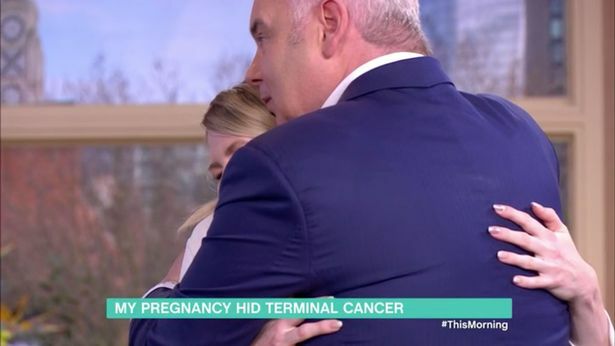 A heartbreaking and inspirational appearance was made on This Morning earlier today when a dying mum revealed that her own pregnancy had kept her terminal cancer hidden. 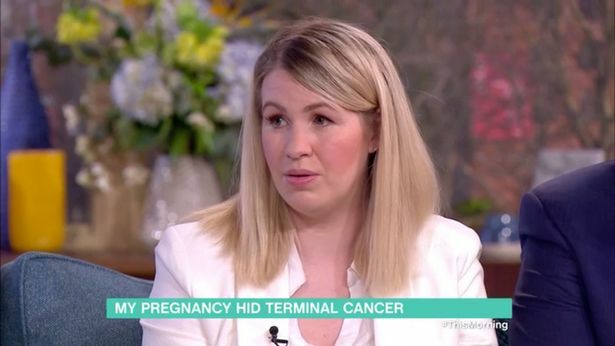 32-year-old, Lisa Wells, made the appearance on the show to raise awareness of the symptoms which bowel cancer brings across. Tragically the symptoms were masked by her second pregnancy and she didn’t find out about the cancer until after she had given birth. After giving birth to her second child back in October, Lisa believed that the worst was over and it was simply a tough pregnancy, reports the Mirror. But in December she was told by doctors she had between just 2 months and a year to live and to spend Christmas as if ‘it was her last’. 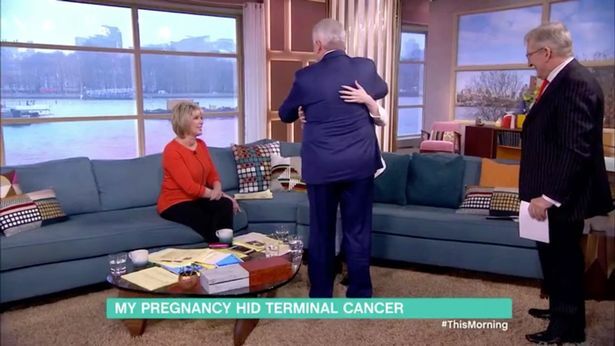 As she began to thank all those who had given her support over the past few hard months, Lisa began to get visibly upset, at which point, This Morning host, Eamonn Holmes, got up to give her a hug. What do you say? I just want to give you a hug. I don’t want to say anything. That’s it, there isn’t anything more to say. However Lisa isn’t letting the cancer stop her from living every moment to the max. She’s currently saving up to buy her two baby daughters their wedding dresses, despite the almost tragic certainty she won’t live to see them wear them. It was completely silent. We had no words to say. I got to the car and just fell down almost. It was such a shock. I knew that they found a tumour so I knew it was cancer but we didn’t know it was going to be that bad. I definitely have to take the lead. I’m a talker. I think that’s always been helpful. That’s why I’ve been so open with things. a lot of people rally struggle to talk about it. Cancer effects so many people. The biggest thing is people doth know what to say. By being open and honest it helps others get through it. Dr Chris Steele, who was sat alongside Lisa throughout the show, explained that bowel habits, blood in stools, lower abdominal discomfort, weight loss and fatigue, are all symptoms of bowel cancer to look out for. Lisa is currently fundraising to raise money for her daughters and to give to Dorothy House, a hospice which gives care to patients and support to their families. You can support Lisa here.